A question was posed to us by a friend after we picked her up at the airport in Portland, where we are house sitting for a few months. She came to visit us just like she came to visit us in Rome and has promised to visit us in Norway this summer. She came bearing her Christmas card for us and a question from a mutual friend: How has travel changed you? I was taken aback by the question. It’s one of those questions for which there is no easy answer. But over the weekend as we drove to the Columbia Gorge and all over Portland the answers started to come out. The conversation would start spontaneously as both Jill and I came up with answers. After over two years of full time travel, it’s starting to feel like we have changed. It’s hard to see change in yourself. That’s why parents always measure their kids heights against the wall – so you can see the incremental changes over time. We don’t have that luxury, so in a lot of ways it’s easier to pose this question to people who know us really well. The only problem is that we don’t see those people very much or for long enough for them to notice a difference. 1. There Are Many Ways to Live. We’ve seen quite a spectrum of different lifestyles around the world. Not just different cultures and climates, but totally different approaches to life, money and how to interact with the earth and fellow human beings. We travelled a fair amount before selling everything in 2015, so we were familiar with different cultures, but we really took a plunge when selling our house and the majority of our belongings and hitting the road. Our old life was one way. Our new life is another. Yours is still another. And our future lives? They are infinite. We took a small tour of Moroccan craft in a historically crafty town called Sefrou. Our guide was a young woman who seemed more curious about us than she was interested in showing us the weavers and iron workers or button makers. We wandered the streets and she asked us questions about our lifestyle. No kids? Isn’t your family upset with you? Don’t you miss being at home? 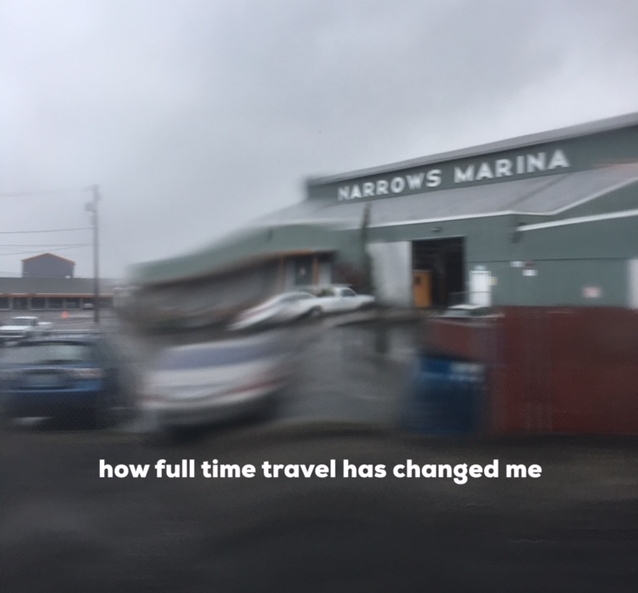 You just…travel? We would answer each question and she would pause and you could see the new information settling on her like a fine drizzle. You don’t have to have children. It’s your choice to have children. Even if she didn’t believe it to be true for herself at that moment or ever, she could see that it was true for us. That there were other ways of being in the world, and that you could challenge each and every one of them. 2. I See People Differently. We were walking in the woods outside our apartment in Vermiglio Italy and I was looking at the verdant abundance of plants growing everywhere. And I started to see the individual plants and call them by name – ruta, iperico, isopo. It was like I was greeting friends I knew, whereas before I was just looking at…greenery. At weeds. At strangers. I started to see the world around me like a paint by numbers that was mostly blank canvas. The difference is striking and it applies to plants and animals and people and everything. Everything is an unknown. Everybody has a story so complex it renders assumptions obsolete. 3. My Bubble Has Burst. I think we realized that we were totally isolated in our lives in Minneapolis. We had our circle of work, friends, yoga and that was about it. There was very little community that we were involved in. Sure new people would come into our circle, but by in large, they looked like us, liked the same things we liked and had a similar income level. 4. My Bubble is STRONG. These two things seem quite contrary, don’t they? How can my bubble burst and be strong? Well, I think that by leaving we had fooled ourselves into thinking that we burst our bubble. And in many ways we did. But in another way we simply created a new and different bubble. Our bubble is way more digital now, and that has it’s own pitfalls, but at least now it includes dozens of random people encountered over a boat ride in the Mekong or a trek over the Great Wall. More people are coming into my bubble, and that is what makes it stronger. Contrary to popular belief, it doesn’t take a pile of money to travel the world for years on end. Hate to break it to you. It just doesn’t. What it does take is a stream of income that can be used to offset your travel and day to day expenses and a redefinition of what you “need” to survive on a daily basis. But how am I fortunate? I chose this life. This was my idea. I didn’t know it would work. I didn’t know if it would break our marriage. I still don’t know what will happen when we stop traveling. But I’m fortunate in so many ways. Fortunate to have been in a position where I could look around and say: There is another way. Fortunate in the way that vegetarians and vegans are fortunate enough to say: I can’t and won’t eat a huge portion of the food that is available to me. I avoid using the word privilege here because I come from a fairly modest upbringing. But privilege does indeed apply. I’m a white dude. What else do I need to say? 6. I’m Just NOT in a Hurry. This may come with not having a 9-5 job and zero commute to work, but I can’t underestimate how much this has changed me. If a car cuts me off, I really don’t care and don’t get mad. I did once while driving in Israel, and let me just say this: don’t flip off an Israeli. I think I did it out of reflex and this old concept of being first and fastest. We are back in the states now for a few months and we’ve been caught in some traffic, but it’s just not the same. I look around at my fellow travelers and know we are all going to the same place, and if it makes you feel better to get ahead of me, by all means. Go for it. You aren’t taking anything from me, and you aren’t gaining anything by being first to the stoplight. 7. Hot Tub Washing Machine. I knew we had turned a corner from our past lives when we were hiking the West Highland Way in Scotland. Our little B&B for the night was fancier than most hotels we stay in, and the bathroom had a hot tub, and upon seeing it we both thought: LAUNDRY. This is what happens when you don’t have access to laundry on a consistent basis. But then again, this is the case for most daily rituals we gave up when we began to travel full time. Things we didn’t necessarily think about and took for granted in our former lives. Simple things like getting from point A to B, doing laundry, asking for anything, finding food, cash or even having a kitchen all become much larger tasks and events. And once you get used to the routine in one country, it resets in the next. People say that life can change in the blink of an eye, and it can. Images of car crashes and muggings and freak accidents come to mind when I hear this phrase. But the phrase refers to dramatic change while ignoring more subtle change. Life IS changing in the blink of an eye. With the blink of every eye. With every blink. Maybe it takes a thousand million blinks to notice the change. Change is like water. It can be a nice misty drizzle or it can be a tsunami. Either way it’s happening and changing us in every moment.